Cut 9 six inch Xmas squares. A total of 108 squares are needed for this quilt top ( 12 of each color). Stitch 9 blocks together to make a nine patch square. Cut through the middle of the blocks. Arrange the cut blocks into a pleasing pattern. Stitch. Twelve large squares are needed. Stitch the squares in rows (3 squares across and 4 down). Suddenly before last Thursday's sewing class I realized I had no project to work on. I wanted something quick and easy. I had not stitched a split 9-patch for a while so a I choose Xmas prints from stash. With a green border the finished size of this quilt is 55 X 69 inches. Now just have to get it quilted before Xmas. Love the ease of the design - results are beautiful! 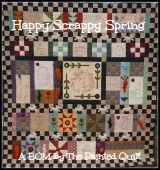 This will be a great scrappy quilt Frances , love it!